The Wine and Cheese Place: Chateau Virgile at a great price! 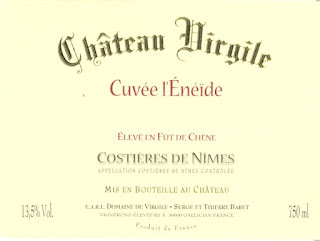 Cuvée L’Éneïde is a selection of the best grapes and oldest vines (many over 90 years old) at Château Virgile. The grapes are hand-harvested, 100% de-stemmed. The wine is then assembled into a cuvée that is aged in a combination of new to 3 year old French oak barriques for 12 months. This is a seriously powerful and concentrated Costières de Nîmes. The wine is dominated by the Syrah, which gives it its dark black color. The nose is rich with black fruit aromas, complimented by a hint of oak, and subtle garrigue notes. In the mouth the wine is sumptuous. It is full of blackberry, cherry, and plum fruit flavors accented by coffee and chocolate notes. The finish is long and silky with ripe round tannins. This wine is an ideal match for steak au poivre, or on a special occasion, a prime rib of beef.